Judging from this New Year's Day post, maybe you can tell what my resolution is for 2016? Well, along with thousands of other people in the world, I've resolved to start eating a bit "cleaner" and exercising more. I actually enjoy eating healthily and my hope is to finally drop these extra pounds that have lingered with me since our daughter was born three years ago. Okay, nobody panic, please. You will still see all kinds of baked goodies and recipes involving lots of chocolate, frosting and cheese here too. This is me you're dealing with after all, and a tiger can't change it's stripes. But, I do hope to reduce the mass that my stripes cover and squeeze them into a smaller dress size by June. So expect to see a few more salads, soups, grilled meats and, yes, smoothies thrown in to the mix here. I think it goes without saying it that every healthy, new recipe will be taste-tested and guaranteed delicious. 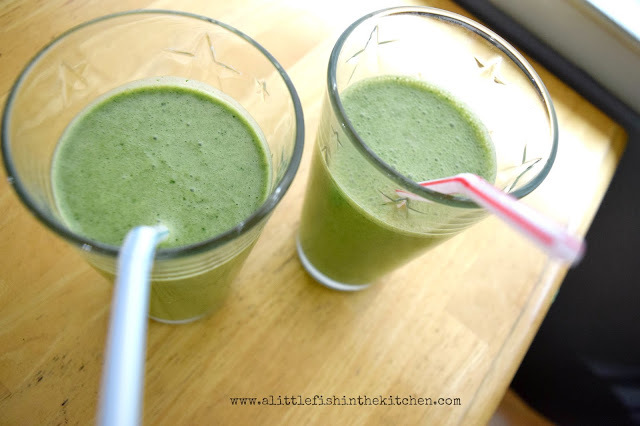 This kale and banana smoothie was breakfast for Evan and I this morning. Our typical morning meal relies heavily on eggs, bread and salty breakfast meats (oh boy, how we love bacon!). So, this was quite a big leap for us and I can tell you honestly that it was better than we both expected. In fact, we drank every drop. As we drank them, it was clear to see that Evan wasn't as sold as I am on our new breakfast specialty. 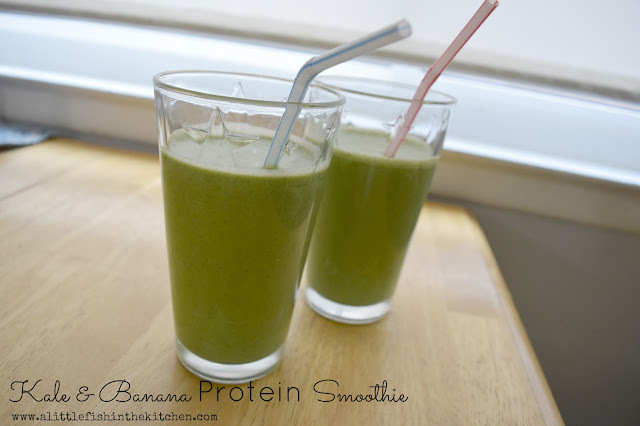 I tried to win him over by highlighting the glorious nutritional facts that applied to the green stuff in his glass: 196 calories, 8 grams of protein, 24 grams of carbs, and an awesome 4 grams of fiber. Not to mention the healthy doses of potassium, calcium, and vitamins B6, A, and C that we just took in! Even after laying all the nutritional details out on the table, I'm pretty sure he still wanted some buttered tortillas and a huge serving of bacon, but he was a good sport and finished his smoothie. We're taking baby steps to a better diet and we're off to a good start, ya'll. Kickstart your healthy New Year resolutions with this easy, healthy smoothie! Healthy and very tasty too, esp. for a kale fan like me. I'm hoping to get a little more exercise too - and cleaner eating is always welcome! Hi Marcelle, I am going to eat a little healthier and excercise more too, usually I am very good until November, December, then I go crazy bad. Your smoothie looks delicious! Marcelle - I have found to start dieting in 2017! In the meantime, I will collect your healthy recipes and set them aside for next year! :-) seriously, I have never been a big smoothie drinker. Perhaps that is a way to start the new year right. 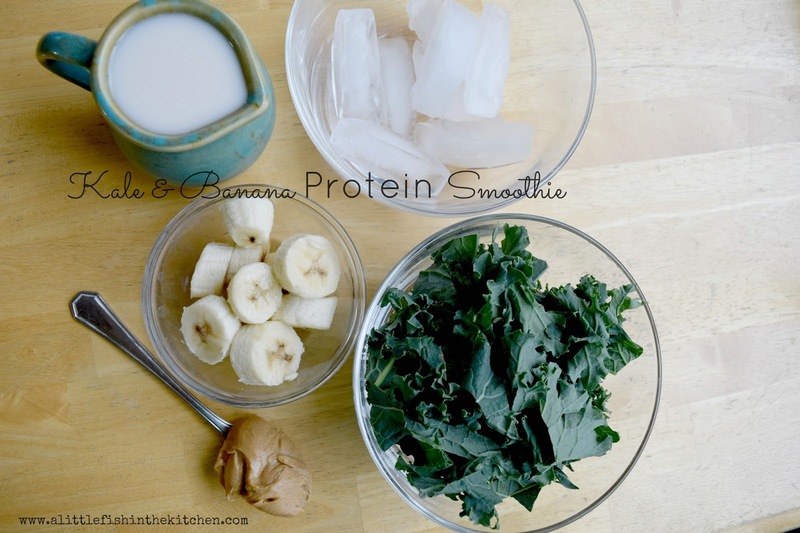 so stinkin' healthy, but tasty too! that's the only way to go, and this might be the only way to get me to consume kale--i just don't like its natural texture! Grace, I couldn't even tasted kale, more the banana and the peanut butter came through. Was really good. Let me know if you try it out! Hi Greg, gladly! Thanks for stopping by! Hi Summer, thank you. It was a nice change of pace! Happy New Year! !